Father-of-two needed four hours of surgery after being bitten, slashed and stamped upon in Middlesbrough nightclub. A dad-of-two says he and his family have been left devastated after he was left with horrific facial injuries after being bitten, slashed and stamped upon in a Middlesbrough nightclub. The 34-year-old victim was also smashed around the head with bottles and needed 70 stitches as a result of the a terrifying attack at Club Bongo International in the early hours of Sunday. Several people were involved in the incident, which began in the smoking area of the Bridge Street West club. Despite his appalling ordeal on a rare night out with family, the victim – who did not want to be named – said he feels lucky to be alive. He says the blade that was used to slash his face could “so easily” have cut his neck. 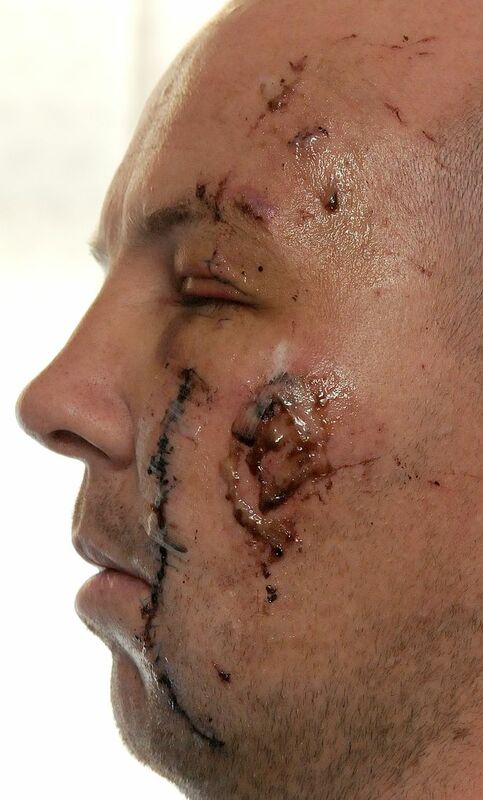 The serious wounds to his face also narrowly miss the man’s eye and have put him out of work for the foreseeable future. The victim underwent more than four hours of surgery after the attack. “I’ve been kicked and stamped on and suffered bruising on my ribs as well as the injuries to my face,” he said. “I’ve probably got a couple of cracked ribs. But I’m going to be scarred for life. “The knife could have gone through my neck and it would have been a very different story. Despite this, the man says he is “trying to get by” and “just get on with it” – with a massive amount of support he has from family and friends. But hearing his partner of 13 years warning their two little girls, aged 12 and eight, about the state of his face at the weekend – and their reaction to the gruesome sight of their dad -“broke him”. “It’s shaken them in a massive way,” he said. “It shattered my girls looking at me. The little one ran off screaming. She didn’t know what to do. “That broke me. I’m devastated. I’m a typical man and I don’t like to show my feelings. I just have to get on with it. However, for now, he has vowed not to go out in Middlesbrough “or anywhere” and couldn’t even face going to the petrol station for fear of people’s stares. “It seems all you hear about is knives and deaths on Teesside,” the victim said. “It’s getting worse every single week. Police are appealing for witnesses to the assault between 1.45am and 2.30am on Sunday, to call DC Joanne Hill on 101 or Crimestoppers on 0800 555111.